In 2017, denim has already got all sorts of sartorial love from your favourite designers around the world. That means major upgrades in the hems department, plus a renewed passion for all things bold and oversized. In stores right now were seeing a sharp shift away from skinny jeans towards comfier, cozier straight legs and boyfriends cuts and denim slides and oversized silhouettes. Shop the latest trends below from H&M’s tear away from the traditional denim jacket, Elizabeth and James perfectly cut boyfriend jeans to Miu Miu’s excessive espadrille updates for your summer to autumn wardrobe. Click the web link to purchase! 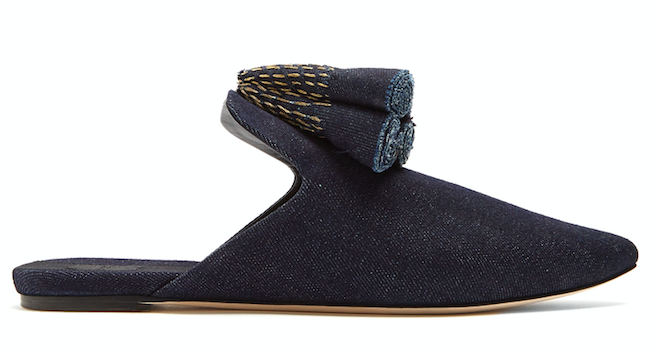 Lend summer looks a hit of individual flair with Sanayi 313’s Sanguarina slipper shoes. Handcrafted in Italy, the signature point-toe silhouette is reworked in dark-blue denim and topped with stacked rolled tonal cones with gold embroidery. Wear them now with a breezy white dress, turning to slouchy trousers when the temperature drops. The perfect choice for those seeking out a true skinny-jean silhouette, The White Company Symons denim is super-flattering, super-stretchy and fitted all the way to the ankle. Sculpting and lifting, our denim is super-soft with a comfortable mid-rise; wear yours with Supergas now and ankle boots later. 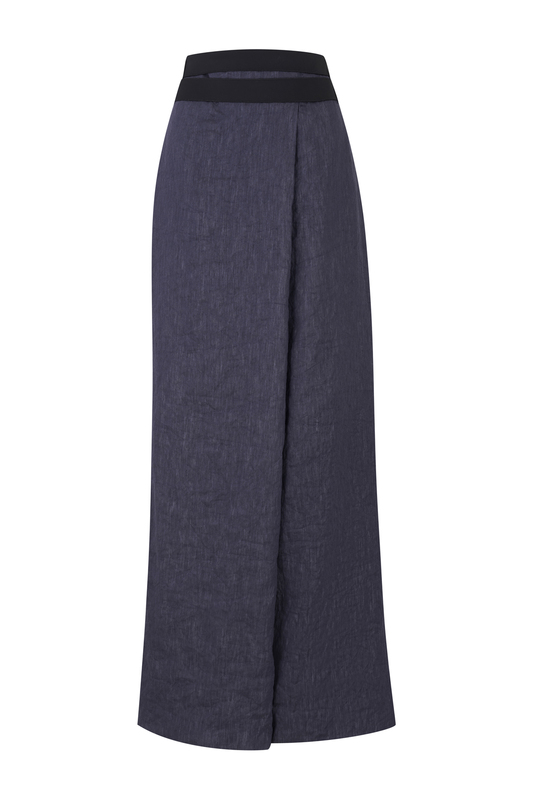 Master effortless chic in Amanda Wakeley’s indigo-blue denim Echo trousers . They’re cut for a voluminous, crossover silhouette and and wrapped with a black satin double waist belt. Continue the insouciant feel with a loose-fitting shirt and oversized coat. Tibi called in Myriam Schaefer to design this black Garçon bag. 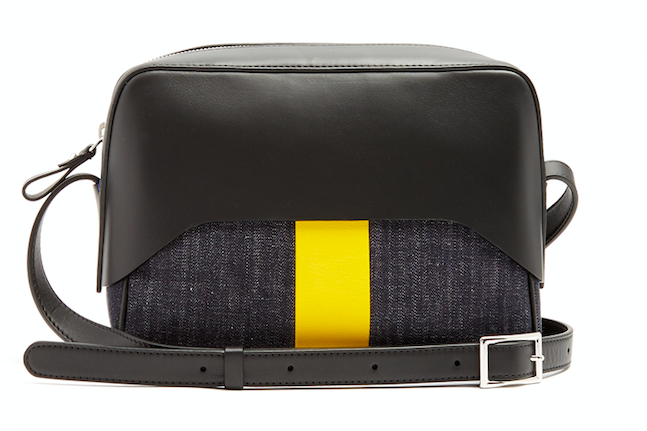 The bag is crafted in Italy and celebrates simple lines and elegant functionality with curved black leather panels – fondly described as a ‘chapeau’ or hat – a denim base and sporty yellow stripe. Sling yours over minimalist looks, storing your cards in the external back slot. Freshly structured. 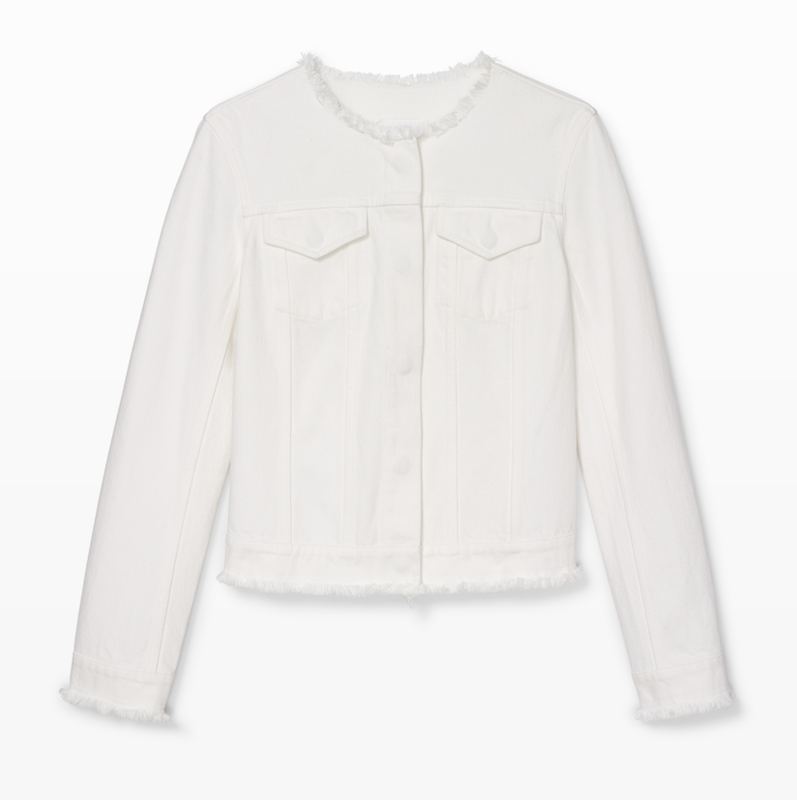 The quintessential jean jacket gets a modern update with fringe trim details and a fresh white colourway from Club Monaco. Layered over tanks and tees, it’s the easy, edgy layer you’ll wear all weekend long. Opting for something subtle and slouchy? These Elizabeth & James pants are the ultimate staple to any closet. Styled up or down they would be perfect for any occasion. Loose through the legs and sat midway on the waist, they’re acid washed and finished with whiskering where creases would normally characterise. Next level, ultra-modern. 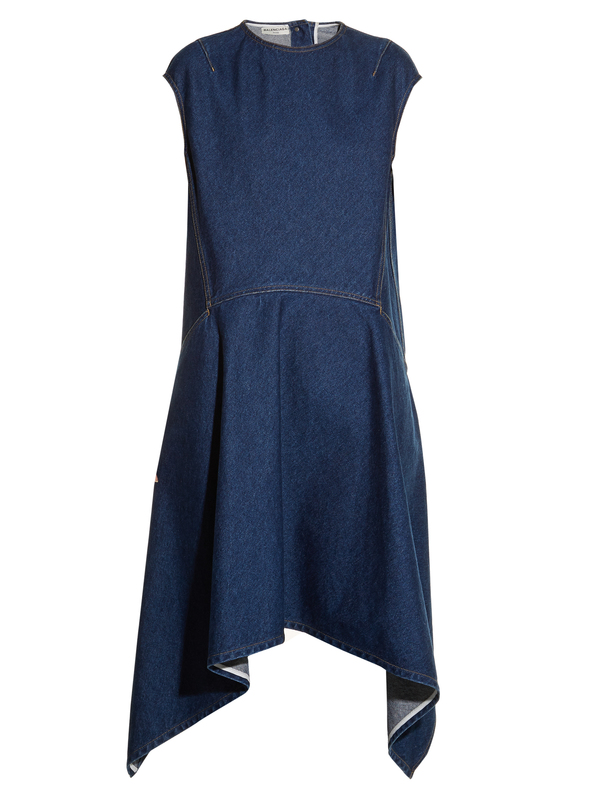 Balenciaga’s blue denim dress is cut to a nonchalant, relaxed silhouette with a round neck and capped sleeves. It’s sliced with a cut-out at the back and ends with a rise-and-fall hem – perfect for showing off the label’s new over-the-knee boots, just like the runway. 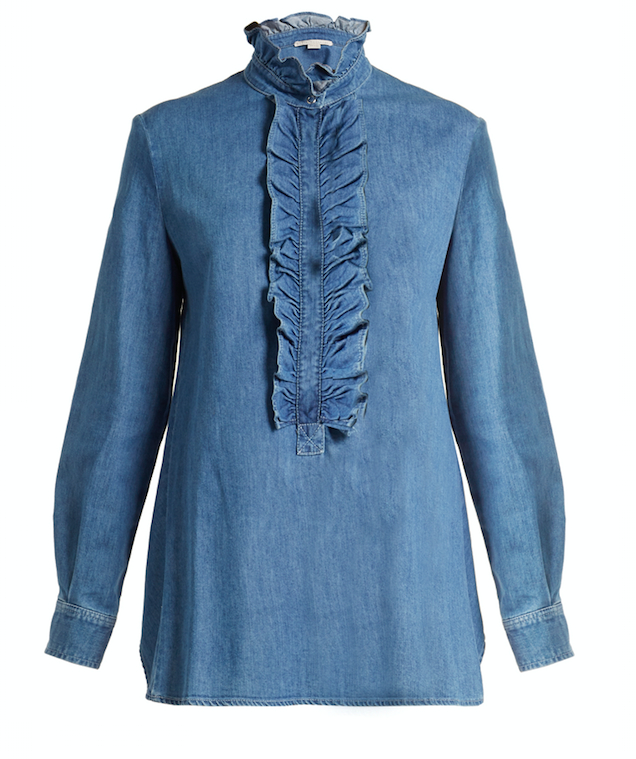 At first glance, Stella McCartney’s blue denim ruffle-trimmed Ina shirt looks like a typically feminine take on a classic, until it turns to reveal an unexpected cropped back. It’s crafted in Italy with a touch of stretch and shaped with a curved front hem that can be neatly tucked while the back panel hangs loosely. Pair it with printed trousers for an effortless look with an unconventional edge. Cool 90’s are back. 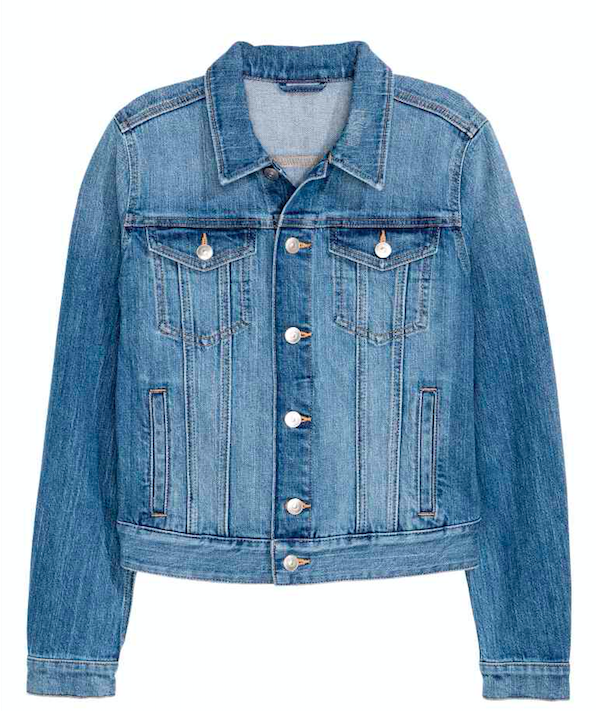 Update your denim jacket this season with this jacket from H&M in a washed denim look with button detailing down the front, flap chest pockets with a button and side welt pockets. Perfect style to edit the autumn wardrobe with! Miu Miu subverts the classic ballet pump with a number of playful cues for Pre-AW17. 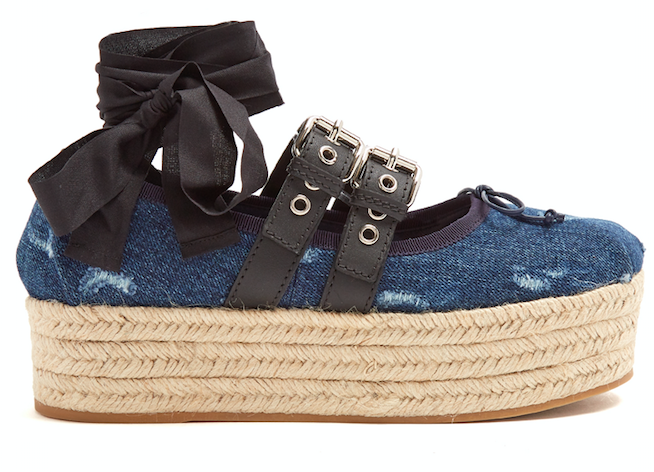 This distressed blue denim pair is wrapped with buckled black leather straps and set on a chunky flatform that’s covered in espadrille-style braided jute. Knot the contrasting gingham and solid black ankle straps into neat bows, keeping them in focus with cropped blue jeans. Style conscious but on a low budget? Meet the classic design with a contemporary twist. 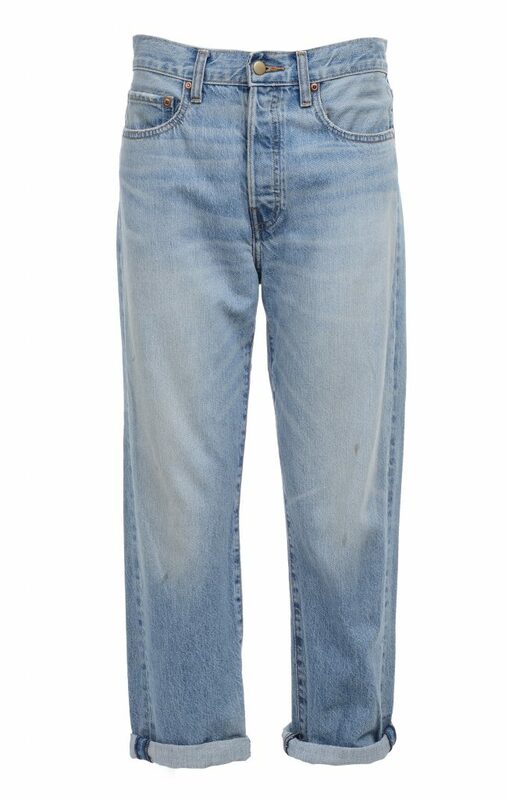 These jeans from Red Herring will quickly become a staple piece in any wardrobe. They come in a five pocket design, with stitching, belt loops and bold ripped denim effect. Completed with a zip fly and silver-toned button fastening, they can be styled with t-shirts or shirts. Inspired by iconic denim styles past and present, McGuire creates jeans as bold as the women who wear them. The brand’s Ambrosio jean features intricate embroidery at the hem with fringe details for a decidedly bohemian look that’s perfect for summer. This entry was posted in Shopping and tagged amanda wakeley, Balenciaga, Club monaco, Denim, Elizabeth and James, H&M, matches fashion, Miu Miu, Red Herring, Sanayi, Shopping, stella mccartney, the white company, tibi. Bookmark the permalink.